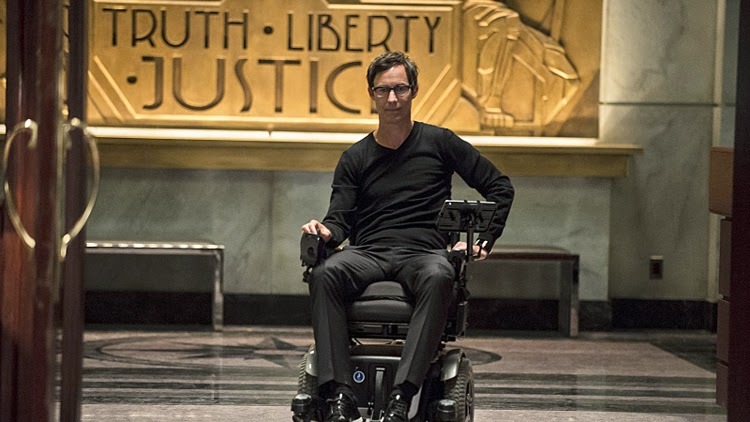 Stacking the Deck: Just who is The Flash's 'Harrison Wells'? See, first and foremost, Rip Hunter has been focused on preserving the timeline, which is something we've already seen Harrison obsess over. One of his major focal points has been the future newspaper article with the headline "Flash Missing: Vanishes in Crisis" ... which is a blatant nod to Barry's sacrifice to stop the Anti-Monitor in the original Crisis on Infinite Earths storyline. Another, more subtle nod, comes from the side story's headline, "Red Skies Vanish". In the DC Universe, red skies always seem to be a precursor to some catastrophic, multiverse spanning event. Hell, the upcoming Convergence event is already being foretold with the same red skies. So, in the DC "Berlantiverse" (which is a moniker I'm going to take credit for making up right now ... unless it's discovered someone beat me to it), it's possible that "Harrison Wells" (yes, I'm thinking it's an "H.G. Wells"/time traveler pseudonym) knows that for his future to continue, he has to ensure the creation of the Flash, and guide Barry to his ultimate fate. None of this is new speculation to other DC Comic fans ... but here's another potential piece of the puzzle. 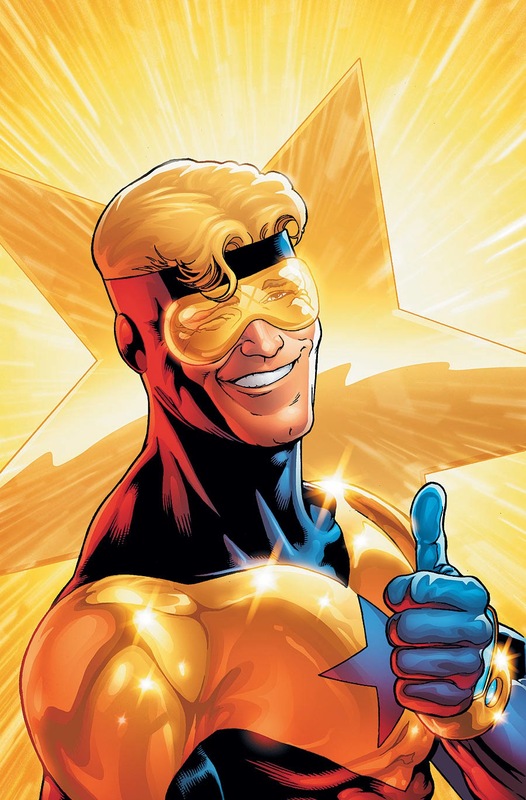 Greg Berlanti and Andrew Kreisberg were already working on the development of a TV series based around another popular time-traveling DC superhero, Booster Gold. In interviews, it was even mentioned that the show (being developed at the time for SyFy) could exist within the Berlantiverse's Arrow series. With Berlanti and Kreisberg having already developed the Booster Gold character and working on fitting him into the Arrow world, it would be a shame for that work to go to waste. If only there was another show, in that same universe, which dealt with issues of time travel. A place that could begin to lay the foundation for a potential appearance (and maybe even spinoff?) by Booster Gold. OH WAIT!! There IS a show set in the same universe that has already started dealing with time travel issues and laying the foundation for a potential Booster Gold appearance: The Flash. And let's not forget that Booster and Rip don't just share their time-hopping hobbies with one another ... they also share a branch on ye ol' family tree. In the comics, Rip Hunter is the son of an older Booster Gold. The two had been working together to maintain the timestream right up until they seemingly vanished after Flashpoint (which, coincidentally, was brought about by the actions of the Flash). However, with DC's new multiverse focused event, Convergence, coming up quickly, Booster and Rip are showing up again ... though lately it's hard to tell exactly which side Rip Hunter is on. It makes sense that Harrison Wells could turn out to be Rip Hunter. Rip has had no problems getting his hands dirty for what he believes to be the greater good. Meanwhile, over on The Flash, we've seen Wells more than willing to do the same in order to protect Barry and the future that the Flash represents. Of course, the writers could end up throwing viewers a huge curve and turn Wells into Zoom, a New God (another rising theory), or hell ... maybe he'll turn out to be Mister Mxyzptlk for all we know. Realistically, there's no reason Wells HAS to end up being ANYONE from the comics, just like Caitlin doesn't HAVE to end up becoming Killer Frost and Cisco doesn't HAVE to end up becoming Vibe (thankfully). The writers can tinker around with things to their hearts' content, so long as the fans stay entertained. But if we end up seeing an episode titled something along the lines of "A Rip in Time", then I'm calling it.